Companies that dare to stand out and envision the extraordinary would love to have plastic business cards. Excellent marketing material to hand out to VIPs and Business executives. Unlike other traditional business card materials, our 20 pt. 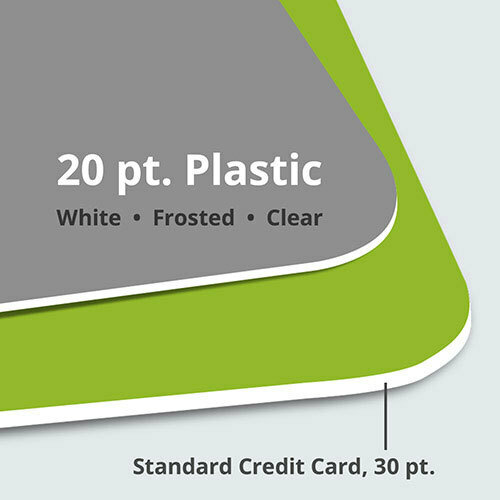 plastic is durable and impresses with its clear, frosted, or opaque white appearance. Plastic business card printing made easy and fast with NextDayFlyers. Why Use Plastic Business Cards? Premium finish with full-color prints for maximum quality. 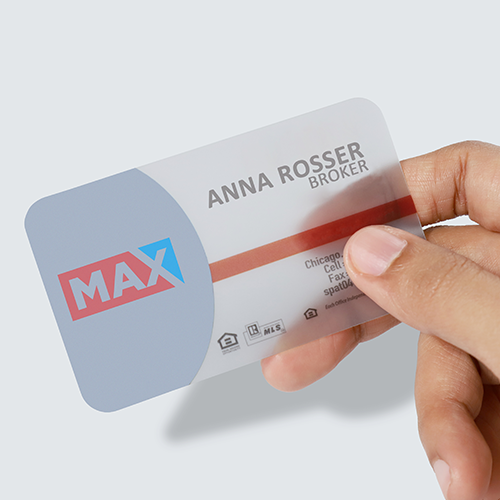 Clear or transparent plastic business cards are completely transparent on both sides. The clean finish leads the eyes to your company logo and company information. Recommended line size: minimum 1.5 pts. Note: All clear plastic orders come with a protective film that should be peeled off to reveal the transparent material. This peel-off layer is meant to protect the card from being scratched during shipping. These business cards suit those who want a glass-like finish but without the see-through transparency. This material is reminiscent of a frosted glass window, allowing colors to pop out and contrast against the translucent background. As its name indicates, this material places your design on an opaque white background. Maximize the space available by printing on both sides of the card. Use bold or dark colors to contrast the white plastic and to highlight contact details on your plastic business card. 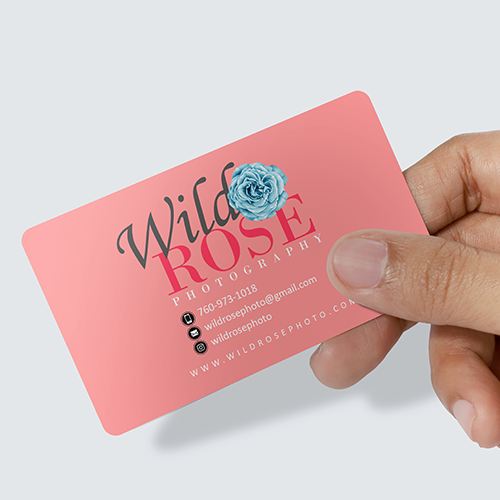 For more details, check out our guide on the what is the difference between clear, frosted, and plastic business cards. We also offer free business card templates to download, Just click on the Templates Tab. 2.125” x 3.375” rectangle size is the same size of a credit card. 1.5”x 3.5” and 1.75”x 3.5” rectangle plastic business cards would easily fit into standard business card holders. 2.5”x 2.5” square size is excellent for small and narrow business card designs. Our oval shape is available at the standard 2” x 3.5” size to provide enough space for your company name, logo, and other contact details. Print plastic business cards with us today and promote your company as a reliable and premium brand. You can create business cards using our online design tool or upload a ready-made design here on our site. Large Rectangle or square business card designs are best fitted with bigger and colorful images. Make use of all available space as much as possible. Use your brand logo or business message prominently in the available space by making it larger. This design is often use for plastic gift card or loyalty cards. Frosted and Clear business cards are great alternatives for custom die-cut business cards. They provide a unique feel when giving out as business cards as they are transparent. 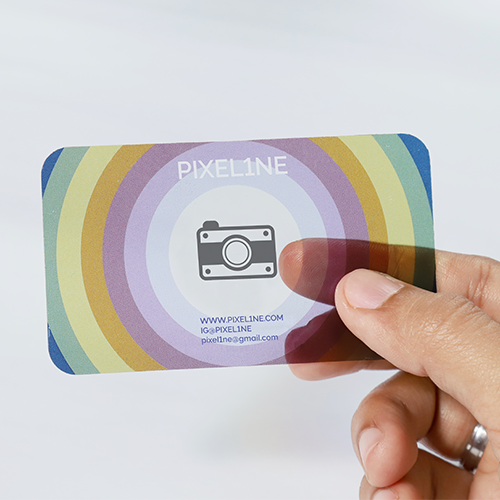 Maximize the space when printing these types of plastic business cards as you might want to lessen the blank and see-through spaces in the card. Use bold and black fonts to create the best possible contrast for all three types of business cards. Making use of light palette colors, pastel, or neon colors would fade into the transparent background. How will any white areas or text appear on a plastic business card? Can I print magnetic strips, add sequential numbering or apply variable printing on my plastic business card order? We recommend printing plastic business cards so your company stands out and becomes easy to recall during important meetings. We do not allow magnetic strips, sequential numbering, or variable printing on our plastic business card printing orders. But if you would prefer to print plastic promotional items, we suggest utilizing our plastic materials to produce discount cards fit for fine dining restaurant and luxury retail brands. Does the printing turnaround time include the delivery transit time? "Printing turnaround" is the number of days allotted to print your order, but does not include weekends and holidays. Shipping transit time is not included in turnaround time. To find out when to expect your delivery, select “Get Estimate” at the bottom of the online calculator. From there, you can select a one day transit time to your area. Pickup options are also available for certain locations.